Kenmore Square is a square in Boston, Massachusetts, United States, consisting of the intersection of several main avenues as well as several other cross streets, and Kenmore Station, an MBTA subway stop. 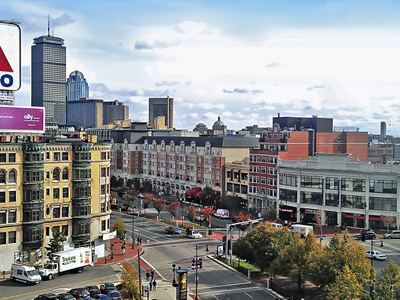 Kenmore Square is close to or abuts Boston University, Fenway Park, and Lansdowne Street, a center of Boston nightlife. It is also the eastern terminus of U.S. Route 20, the longest road in the United States. The land that is now Kenmore Square was originally the swampy, uninhabited corner of the mainland, which marked where the narrow Charles River fed into the wide, marshy Back Bay. It was part of the colonial settlement of Boston until 1705, when the hamlet of Muddy River incorporated as the independent town of Brookline. The land ended up in Brookline because the Muddy River - several blocks to the east - formed the eastern border of the new city. Here's the our members favorite photos of "Plazas and Squares in Boston". Upload your photo of Kenmore Square!